Fortunately, I had a pre-existing positive relationship with writing, even as a kid. I started keeping a journal in the 3rd grade, a practice that still continues today. I wrote short stories and poetry and essays, largely to help process and escape from my own youthful angst. Writing punishments in the classroom were alternately frustrating or annoying, but I never internalized them in a way that changed my relationship with writing itself. Writing was too important to me to let outside circumstances interfere. Being a mental wanderer, I began to reflect on my relationship with running in a similar manner. 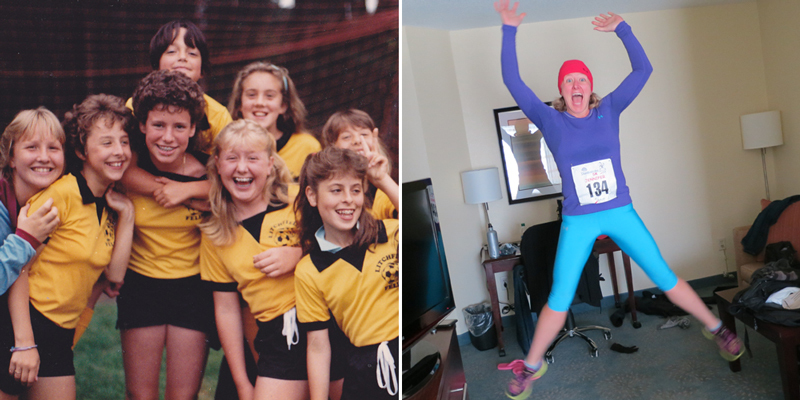 Why did I not become a runner until my mid-30s? What took me so long to discover my interest in and the actual joy I get from this simplest of sports, a freedom and joy similar to the one I experience when free-writing? Then I reached high school, and things changed. I showed up at tryouts as a wide-eyed freshman who had ignored the mandatory off-season conditioning plan. Why would a 13-year-old-girl, obsessed with boy crushes and babysitting, want to spend any portion of her dramatic “last summer before high school” running laps around her neighborhood when she could be riding her cool 10-speed bike to her friends’ houses? The conditioning plan called for running something like 2-3 miles 2-3 times a week in the weeks before official pre-season practices started (easy breezy for me now, but torture back then). Pre-season itself meant double-sessions, practicing from 7-9 AM daily and returning again for practice from 4-6 PM. And practice took on a whole new meaning in high school. Gone were the days of having fun on the pitch, giggling and running drills. We were simply running. And run we did. We ran laps, we ran complexes (laps around the entire set of sports fields at our high school), and we ran sprints. We ran to reflect on our failures after a loss, and we ran to build momentum after a win. We ran and ran and ran. I was no longer playing soccer. In fact, I was no longer playing anything. I was running, and I hated it. I loathed the coaches and their whistles. I struggled to keep up with the faster girls. I was bored, and I wasn’t having any fun. I was being punished, twice a day, every day, all August long. The pattern continued for years. Eventually, in my early 20s, I stopped playing soccer, distracted by depression and work and life. I struggled to figure out who I was and what I wanted to be. Although I was experiencing professional success, I developed negative relationships with food and people and other things that weren’t so good for me. And then, at 35, in what can only be interpreted as a desperate act of madness, I started running. Out of shape and overweight, my first tentative steps took place on a treadmill in a dark corner of the gym. At first, I was jogging 30 seconds at a time, followed by 90 seconds of walking. 30 became 60 and then 90, working up to running for two minutes in a row before I needed a walk break. I kept at it, three or four times a week. Eventually, two minutes became five, and one mile became two. As motivation, I signed up for my first 5K, followed four weeks later by my first 10K. (Go big or go home!) I was slow, but I was running. Fast forward two years, to last year, during which I ran more than 700 miles and participated in 14 races. I’m on pace to surpass that mileage number this year. I’m set to conquer my third half-marathon this weekend, and I just signed up to run my first marathon this fall. I consistently run 20+ miles per week and actually look forward to most of them. I’ve coached friends and family and clients on running technique and introduced several to the sport. This entry was posted on April 4, 2013 by Words Per Gallon. It was filed under Fitness, People, Running, Writing and was tagged with accomplishment, choice, intention, joy, punishment, running, soccer. I love that you reclaimed running! I never had it to reclaim, but I did discover it later in life (just a year or so ago at age 31). It does, indeed, bring such joy. I know not to everyone, but to those who connect with it in that way. Lovely story – thanks for sharing it. You figured out a way to make me cry those tears of JOY 🙂 🙂 !! This is a wonderful 27 year synopsis on the motivational factors that have created a lifelong effect on children and adults. You have figured out the right ways to turn negatives into positives. You go girl! We will see you and M at the finish line this Sunday in Newmarket! We like happy tears. I’m sure I’ll be shedding a few of my own on Sunday! Proud of you J! I’m so interested in your journey. Love your pics and writings. You inspire this ole lady.